Click for images above for larger, downloadable versions. 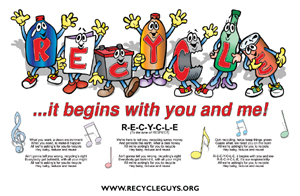 Download Recycle Guys Song or Ringtone. To add a ringtone to your phone: 1) Save/download the mp3 ringtone file to your computer. 2) Send the mp3 file to your phone. Depending on your phone and service, you may be able to do it via a USB cable, by emailing yourself and downloading the attachment over your phone's email or by texting yourself from your email account.This works best using a Smart Phone with internet capability.